Eight hundred and sixty recipes, covering the whole range of cookery, eight colored plates, and two hundred and twenty-six half-tone illustrations. 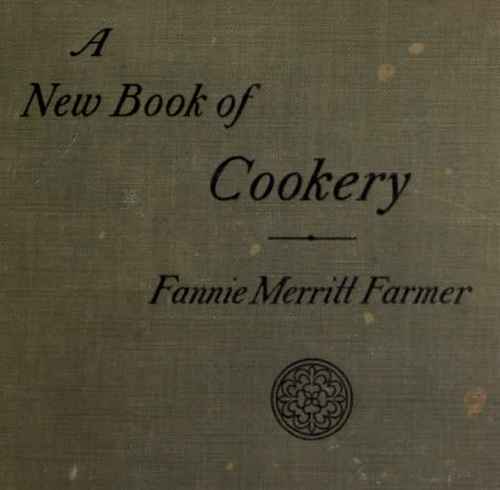 By Fannie Merritt Farmer Of Mist Farmer School of Cookery. Author of "The Boston Cooking School Cook Book" "Food and Cookery for the Sick and Convalescent," And "Chafing-Dish Possibilities". "The art of cookery, when not allied with a degenerate taste or with gluttony, is one of the criteria of a people's civilization". "We grow like what we eat; Bad food depresses, good food exalts us like an inspiration."